Lock in a great price for Mini Hotel Übernachten Im Gurkenfass – rated 8.7 by recent guests! The food at the restaurant was good. The bed was super comfortable and there was enough heating in the cabin (which could be adjusted with a thermostat). There were mosquito nettings around the windows that opened (super helpful in keeping all the mosquitos out). Our wine barrel was delightful. Most of the space taken up with the huge bed. One person at a time could occupy the other space, but it worked for us. We were able to take a long walk in the Spreewalt. Beautiful area. A large vat converted into bunk bed accommodation, small, snug and cozy. Do not expect a three star hotel, but it was a five star experience! Well provided with heaters. The restaurant has good traditional local food. A 10 minute walk along a charming street to the riverside. Excellent recommendation by staff, which we second, for a magic river poling cruise by the 'Green Vests' company - we did the 'Nature trip'and not the one to the museum village. Das Frühstück wurde am Tisch serviert (kein Buffet) und war seeehr abwechslungsreich und lecker. Das Frühstück war super,die Abendkarte war reichlich und Preiswert.Personal war sehr freundlich und zuvor kommend.Wasch Gelegenheit war zwar im Container,aber für Camping sehr sauber und geflegt. Personal sehr freundlich, top Sauberkeit. Bequeme Matratzen, super Lage! Sehr zu empfehlen!!! Mini Hotel Übernachten Im Gurkenfass is located in the Old Town of Lübbenau. This quirky barrel-shaped caravan features a garden and shares the facilities in the main building. 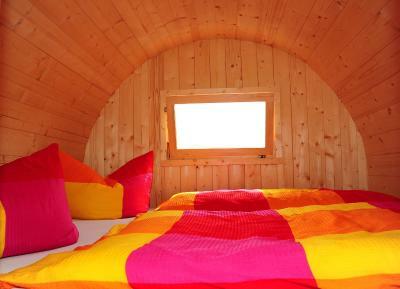 In addition, Mini Hotel Übernachten Im Gurkenfass comes equipped with a cozy seating area and shared bathroom. Heating is available during the colder seasons. The main building offers an a la carte restaurant, and a further selection of restaurants can be found within a 10-minute walking distance of the accommodations. The nearest supermarket is 0.9 mi away. Popular activities in the area include hiking and cycling, and bicycles can be rented from the accommodations. For day-trips, the center of Berlin can be reached in 1 hour by car. Lübbenau Train Station is 1,950 feet from Mini Hotel Übernachten Im Gurkenfass, and there is free private parking available. This property is also rated for the best value in Lübbenau! Guests are getting more for their money when compared to other properties in this city. When would you like to stay at Mini Hotel Übernachten Im Gurkenfass? This cozy double room features a dining area, garden and shared bathroom. Heating is available during the colder seasons. House Rules Mini Hotel Übernachten Im Gurkenfass takes special requests – add in the next step! Mini Hotel Übernachten Im Gurkenfass accepts these cards and reserves the right to temporarily hold an amount prior to arrival. We did not figure out how to use the heating system until the next day (after a very cold night). We did not know that there would not be complimentary toiletries available (ie shampoo, soap). WiFi reception limited to restaurant area. The 30 m walk to the shared bathrooms may become a challenge in winter. Nobody spoke English, but we sort of managed to communicate rudimentarily with the staff who were friendly.